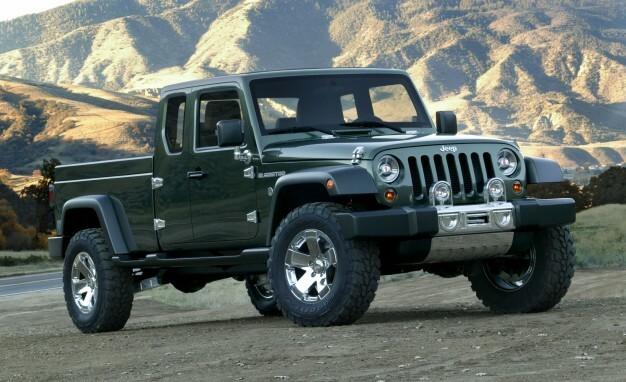 Rumors of a Jeep pickup have been circulating for years, but both Mike Manley (Jeep's global chief) and Sergio Marchionne (Fiat Chrysler's CEO) have now confirmed to The Detroit News that a Wrangler-based pickup will be introduced late in 2017. This has set the enthusiast press on fire. Marchionne added that the pickup should launch late-2017 after the next generation Wrangler rolls out which, he said, is 'phenomenal'. “The car [Wrangler] is done, the car [Wrangler] is designed and it’s been engineered, so we just need to get off our butts to start producing,” he said. "It's the best thing we've ever made. The design won’t see a drastic change, in order to keep the SUV [Wrangler] true to its historical DNA and instantly recognizable." With the incredible sales and profitability of the JK Wrangler, both Manley and Marchionne have the winning formula and want to continue offering what buyers clearly want - an unabashedly off-road-oriented platform that is proudly the opposite of the ever-more-street-oriented influx of emmasculated pickups and SUVs. If the new Jeep pickup (not to mention the Wrangler) is equipped with a proper pair of solid axles, I am certain that many pickup owners will be trading in their IFS Toyota Tacomas, Nissan Frontiers, Chevrolet Colorados, and GMC Canyons for a new Jeep pickup truck - especially if rumors of a diesel engine prove to be true. I will gladly trade-in my JK Rubicon for a Jeep pickup; I'll order mine with 4 doors, the heaviest-duty axles, the lowest available gearing, diff locks, a disconnecting sway bar, 4:1 transfer case gears, and of course the EcoDiesel!